Make a unique statement with plastic! Gladding Graphics specializes in printing on “hard to dry” substrates like plastic to provide our customers with more options and longer life mediums than paper printing. 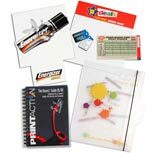 Printing on these materials ensures your message won’t easily tear, curl, fray, fade, or be missed! What can you create with these materials? • Call us for more ideas! Don’t forget we can print on paper too…. that’s easy!